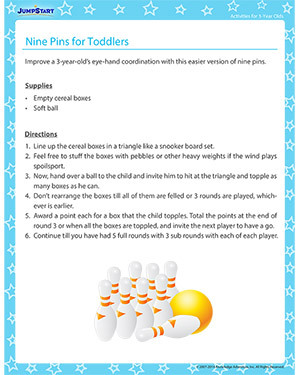 Since bowling has become a rage, why not make the most of it and form an activity for 3-year olds with the game? We’ve done the hard work, formed a nine pin game for toddler, and documented the steps for you to just download the activity and get started with a bunch of cereal boxes. Check out more toddler activities on JumpStart.